PRINT EM BEFORE THEY'RE GONE! SIX Different Ziploc Printables for Upcoming Deals! 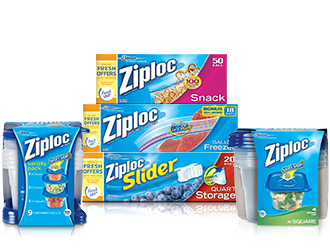 Three more brand new Ziploc printable coupons now make a total of six that we have available. Ziploc deals are pretty regular (particularly during the school year), so we recommend that you print and hold them for an upcoming deal. Ziploc bags will be on sale BOGO 50% OFF at CVS starting 2/22/15 and we'll let you know what other deals are out there as new ads come out. Patrick is a sales executive, husband, and father of four children; one son graduated from college, one son in college, a daughter in grade school, and a 5-year old son. He is an accomplished couponer and knowledgeable on couponing at a variety of stores. Follow Patrick's Weekly Deals and Shopping Trips and visit our Insiders Chat Group to ask questions and master the art of couponing for yourself!